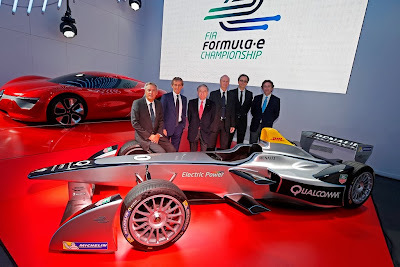 Four-times Formula One world champion Alain Prost will be involved with a team competing in the new electric Formula E series due to start next year, organisers announced on Thursday. They said in a statement that the Frenchman, who made a failed attempt to run his own team in Formula One from 1997 to 2001, had linked up with compatriot Jean-Paul Driot to enter a new e.Dams team. Five teams have now been signed up from a planned field of 10 to race in city centres around the world starting in Beijing in September. "Being able to actively participate in the development of this new technology, which is 100 percent electric, is extremely motivating," said Prost. "As we've seen in other championships, 2014 will see a move towards more sustainable racing, proving more than ever that motorsport is the benchmark for the future." Driot's Le Mans-based DAMS teams have won petrol-engined championships in various junior series, including GP2, A1 GP, Formula Renault 3.5 and International Formula 3000.